WDG-Music returns with another remix compilation, jam-packed with musical homages to a blasting progressive psytrance tune. 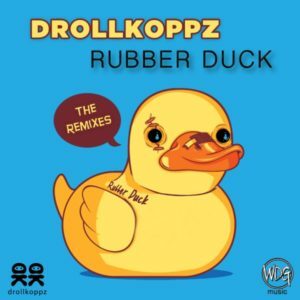 This time it’s Drollkoppz’s “Rubber Duck”, originally heard on Saurebad, released five years ago on their old label Panzar Produktionz. This release features seven eminently diverse and modern progressive reinterpretations that reach into young and experimental subgenres like goa minimal, psybreaks and dirty prog. Mastered by Robert Hundt/Radioactive.Cake at Anti-Logic (Berlin). Cover design by Matthias Kley. MP3 Download | FLAC Download | WAV Download · Download count: 4,871. I had to delete a bunch of comments here that crossed over from criticism into abuse (and the drama that invariably accompanies it). You’re welcome to share opinions both positive and negative around here but do so with at least some measure of civility. Thanks man, it got hecktic and full of nonesense. Thank you very, very much for all of this music. I love this stuff! why would any one at all criticize any of this music at all! I’ve only been listening to this type of music for only just around a year and a half. And love the good vibes it brings. This album I thought was a kicker! nothing wrong with it. I’m thankful I found this site. Because most psytrance cd’s are expensive! so this site has helped me discover a lot of great music for free. And has made me change my mind on how I release my music to people. So thanks!